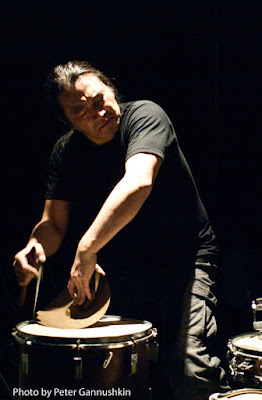 Tatsuya Nakatani is a creative artist / percussionist originally from Osaka, Japan who has released over sixty recordings in North America and Europe. Residing in the USA since 1994 he has performed countless solo percussion concerts and has collaborated with hundreds of artists in international music festivals, university concert halls, art museums and galleries. His latest project is the Nakatani Gong Orchestra, which builds community ensembles performing on multiple bowed gongs under his direction, as recently presented at the Kennedy Center in Washington, D.C. Nakatani’s constant touring fosters the raw and fresh quality in his music, which can only survive through an open willingness to share energy, culture, music and self on a global human scale. His master classes and workshops at schools and universities, emphasize his unique musical approach and philosophy in creating visceral, non-linear music. He has created his own instrumentation, effectively inventing many instruments and extended techniques. He utilizes drums, gongs, cymbals, singing bowls, metal objects, bells, and various sticks and bows to create an intense, intuitively primitive, expressive music of unusually strong spirit that defies category or genre. His music is based in improvised/ experimental music, jazz, free jazz, rock, and noise, yet retains the sense of space and beauty found in traditional Japanese folk music. tradition of Sidney Bechet, Steve Lacy and Evan Parker, Doneda’s virtuosity on the instrument is widely recognized by his peers. He has developed one of the most extensive musical vocabularies in free improvisation. His playing can be at turns lyrical, playful, or raucous, and can switch from the liveliness of street melodies to circular breathing, microscopic sounds, or shrieking outbursts. In 2014 a solo recording was released for his 60th birthday and other renowned soprano saxophonists contributed words of praise for the release. 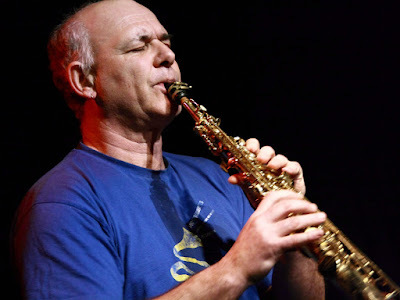 “There is no doubt he has and is exploring new territory on the soprano,” Dave Liebman. “Doneda’s playing has that magic that leads us to the sound through a within perspective, delivering elements, breathy particles, sudden flashes and thick transparencies in a sort of pulsing-pixelating dance," Gianni Mimmo. “Doneda’s playing begins somewhere deep inside and continues uninterrupted through to the golden metal bell beyond his fingers. It is all horn and it is unified. Nothing is deconstructed. Nothing is parsed; nothing is broken into pieces. It is always whole,” Joe Giardullo. Doneda is always searching and exploring, looking for new situations and collaborators. Through the years he has played with such luminaries as Elvin Jones, Lol Coxhill, Evan Parker, Roger Turner, Fred Frith, Keith Rowe, Xavier Charles, Barre Phillips, and John Russell, as well as the Pygmies of Gabon, the Basque singer Beñat Achiary and even the rock band Sonic Youth. He is also involved with Butoh dancers like Masaki iwana and Yukiko Nakamura. He works with poetry and experimental movies as well.